Casio G-SHOCK announces the addition of five new timepieces to the men's Black Out series. 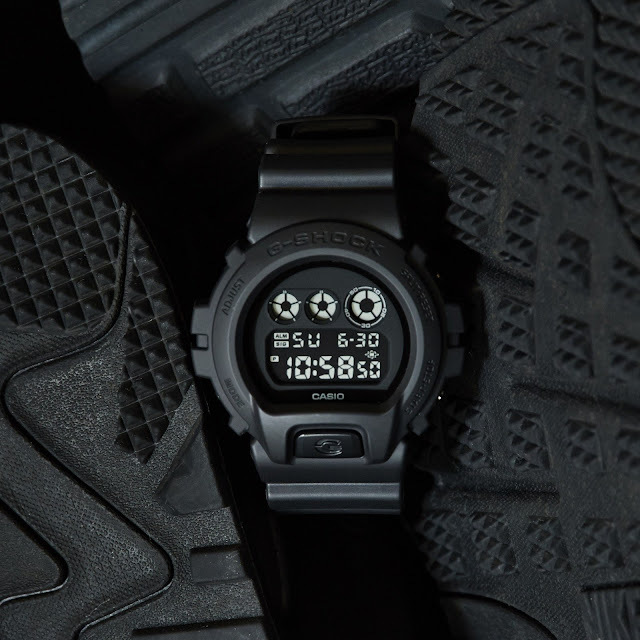 Now comprised of 10 total styles, the latest releases include a DW5700 revival model, two new DW6900 models and one new GA100 model – all offering absolute toughness for any situation with a tactical inspired colorway. The DW5750E-1B features a 45.4mm case, with a circular bezel and resin band. The new DW6900 timepieces, which feature a 50mm circular case and bezel, will come in both a resin (DW6900BB-1) or CORDURA®* cloth (DW6900BBN-1) band, which provides extremely high resistance to stretching and tearing. The updated GA100 (GA100BT-1A) will feature a new, textured band and a 51.2mm case. The GA100BT-1A, DW6900BB-1, and DW5750E-1B will retail for $99 USD, and will be available for purchase at G-SHOCK retailers, including Macy's, shopcasio.com, and the G-SHOCK Soho Store. The ok DW6900BBN-1 will be available at select fashion boutiques nationwide.